The original bannocks were heavy, flat cakes made of unleavened barley or oatmeal dough formed into a pancake shape and then cooked on a griddle. In ancient times, Celts made special bannocks to celebrate the start of each new season according to the Celtic calendar. Other special varieties of bannock are identified based on the flour or meal from which they are made, whether they are leavened or not, whether they have certain special ingredients, how they are baked or cooked, and the names of rituals or festivals in which they are used. A particularly well-known Scottish bannock is the Selkirk Bannock, a spongy, buttery, raisin-filled cake made from wheat flour. When Queen Victoria visited Sir Walter Scott's granddaughter at Abbotsford, she supposedly took her tea with a slice of Selkirk Bannock, ensuring that its reputation would be forever enshrined. Today, Selkirk Bannocks are popular throughout Great Britain, and can be found at most large supermarkets. The bare-bones version this traditional recipe involves mixing uncooked oatmeal with a little melted fat, a dash of salt, and less than a tablespoon of water into a thick dough. The dough is then rolled into little balls, flattened, and fried on a hot griddle like pancakes. 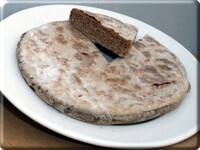 The following recipe is derived from RampantScotland.com. Mix the oatmeal, salt and bicarbonate into a bowl, and pour the melted fat into the centre of the dough. Stir well and add enough water to make the dough into a stiff paste. Cover a flat surface in oatmeal and place the dough onto this. Work quickly, as the dough is difficult to work if it cools. Knead the dough and flatten it to about a quarter-inch. Cut circular cakes three- to four-inches in diameter from the dough, using a mug as a template. Gather the scraps of dough together, re-roll them, and cut into additional bannocks. Cook the bannocks in a lightly-greased, heated pan on high for about 3 minutes until the edges curl slightly; flip the cakes and cook the other side for an additional 3 minutes. An alternative method of cooking is to bake the oatcakes in an oven at 375°F or 190°C for about 30 minutes or until brown at the edges. The quantities above will be enough for two bannocks about the size of a dessert plate. If you want more, do them in batches rather than making larger quantities of mixture. Store in a tin and reheat in a moderate oven when required.